Try These New Labels Based In Delhi For Designer Bridal Lehengas! 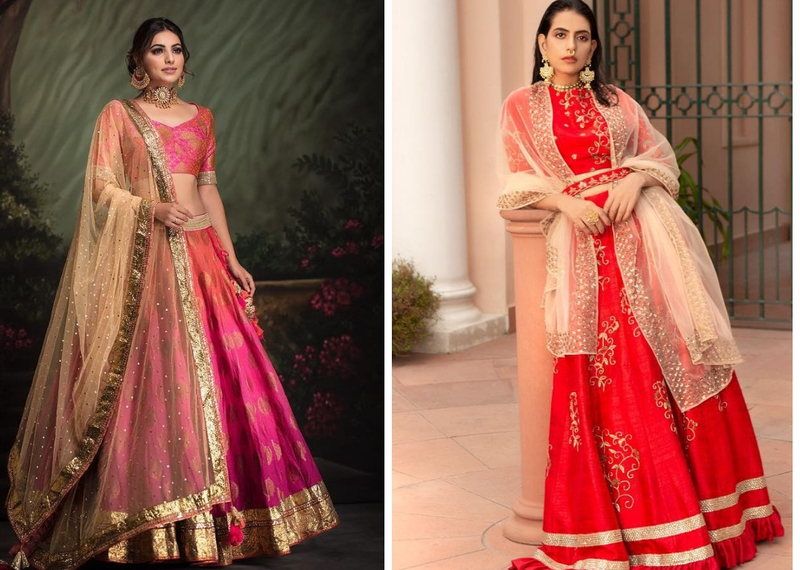 9 New Labels Based In Delhi For Refreshing Designer Bridal Lehengas! Every bride-to-be dreams of wearing those perfect designer bridal lehengas for all her wedding ceremonies. 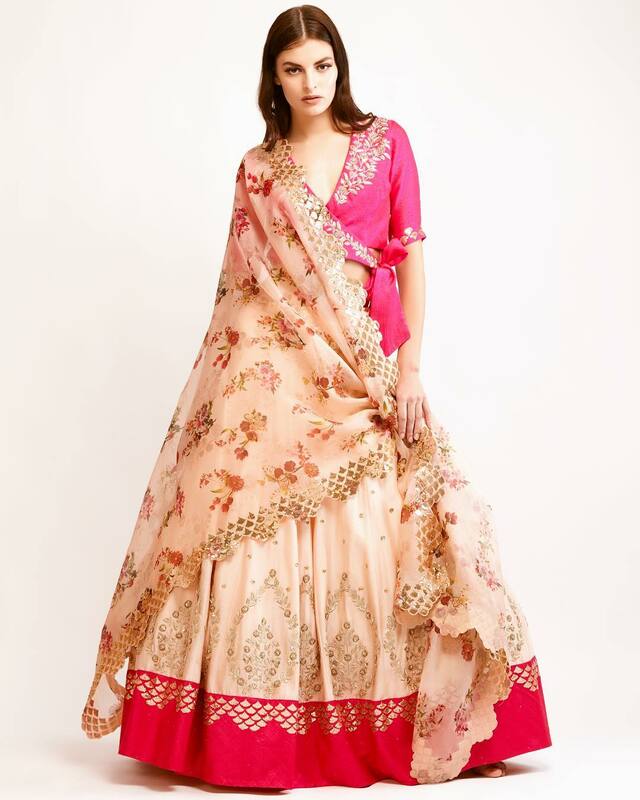 Truth be told, there are so many amazing new labels that can give a strong competition to renowned designers like Manish Malhotra and Sabyasachi. You may not be aware of these refreshing new labels in Delhi who are also well known for their bridal wear. 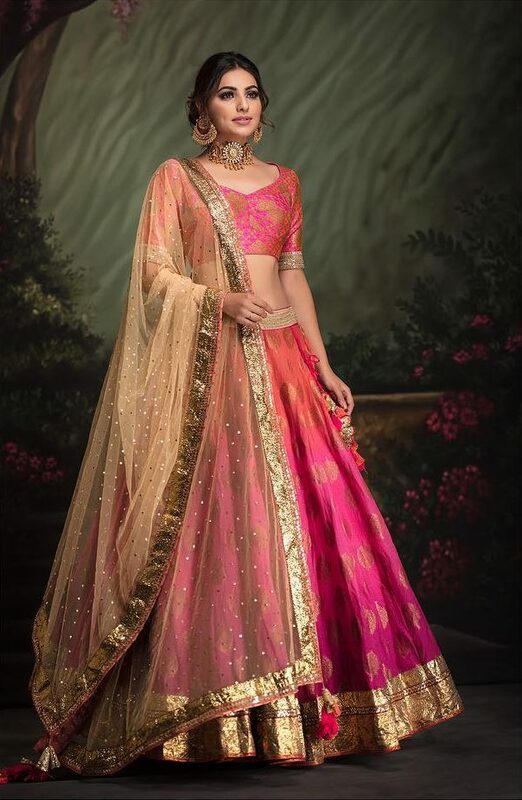 It is great to find new labels that make gorgeous designer bridal lehengas, which are not only unique but are bespoke and refreshing. These emerging labels in Delhi are oozing with fresh designs that would take the edge off the famous designer labels. As the name suggests, Devnaagri is as Indian as it can get. They believe in designing clothes for women who are independent, bold, free-spirited and yet, rooted in their culture. From a blast of colours to the subtle ivory and gold, you will find a variety of lehengas at Devnaagri. Even celebrities like Kusha Kapila, Parineeti Chopra, Soha Ali Khan, Fatima Sana Sheikh and Vidya Balan approve of this label. Shop for their collection here. Neha Mehta knows what Indian brides want for their special day. 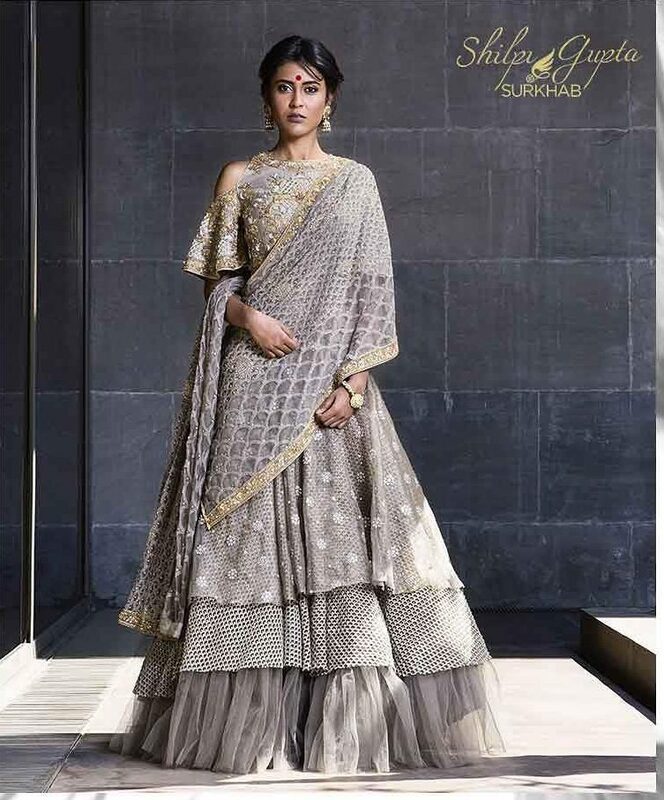 From simple bridal lehengas to the heavier ones, she has one special outfit for every kind of bride. 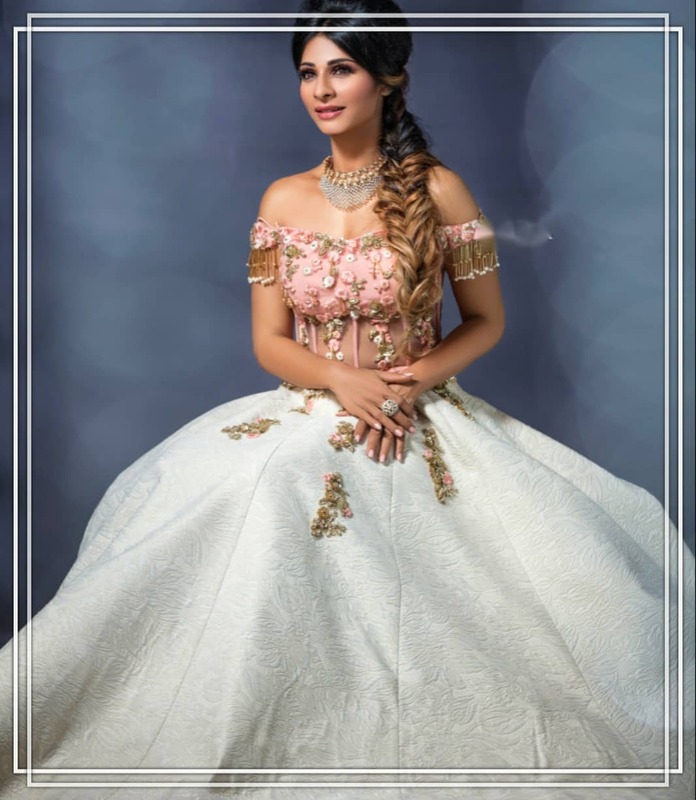 At Neha Mehta Couture, you will find a variety of Indian dresses which you can buy to put together a stylish trousseau as well. Bold and unapologetically flamboyant, this is the style of Shilpi Gupta Surkhab. She believes in using bright colours and dramatic layers which gives her couture a different identity. One thing is for sure, you will never find anything as unique as Shilpi Gupta Surkhab’s designer bridal lehengas. 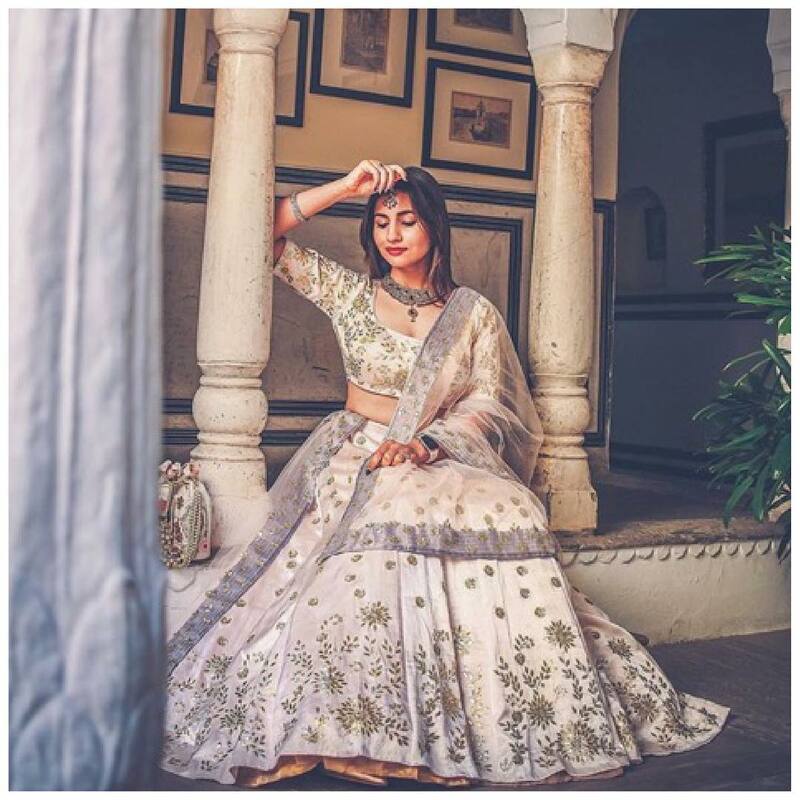 Amrita Thakur’s designer bridal lehengas are all about pretty pastels. 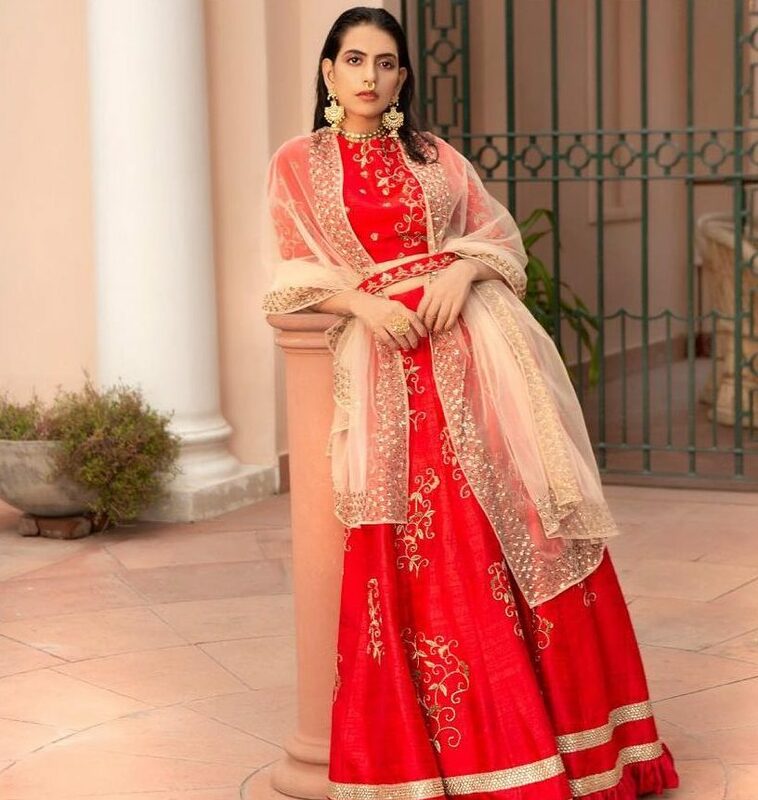 If you are planning to ditch everyone’s favourite red for your wedding, you should see what Amrita Thakur has in-store for the brides. She gives due importance to soft colours that ultimately make a bride look like the protagonist of a fairy tale. Class and finesse define the bridal collection by Ridhi Mehra. Her designer bridal lehengas can give a tough competition to the A-lister designers of Bollywood. Her bridal line always runs along with the latest fashion trends. 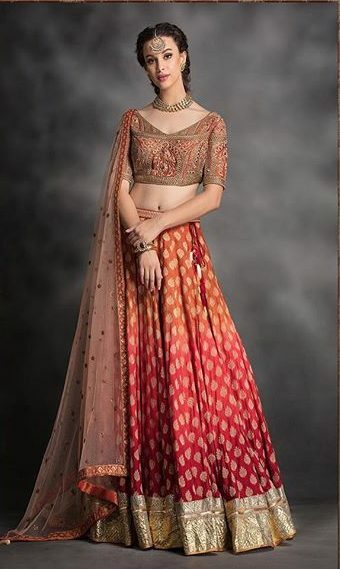 You will definitely look like a celebrity if you are wearing a lehenga from Ridhi Mehra’s collection. If you are one of those brides who like to dazzle and shine then Junne Couture of one of the best new labels for you. Their designer bridal lehengas flaunt a lot of sequin and faux feather work which is perfect for all the fashionista brides. You will look like a model straight from a runway in a Junne Couture bridal lehenga. Sahrish Kazmi is a talented designer with a knack for weaving contrasting colours together. Carrying bold and light colours together is one fashion trend that is catching up rapidly. 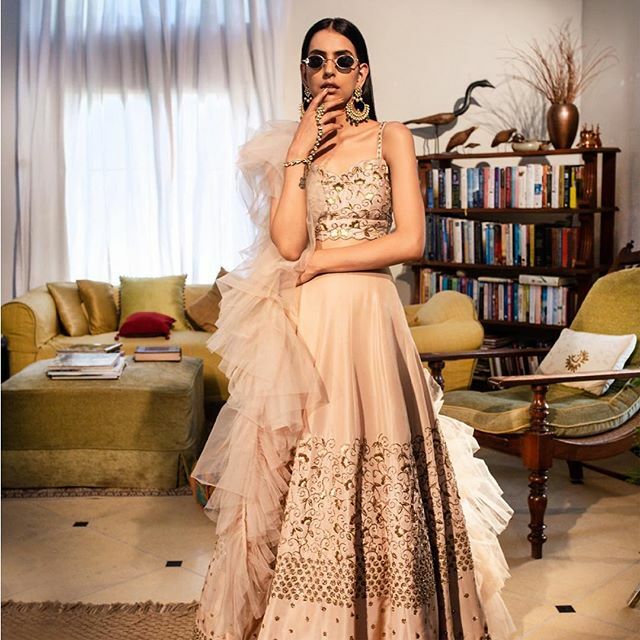 With so many masterpieces stacked up in her collection, this new label has so much to offer to the brides than those usual Sabyasachi designer bridal lehengas. Brides who prefer feminine outfits will love Amit Sachdeva’s label. 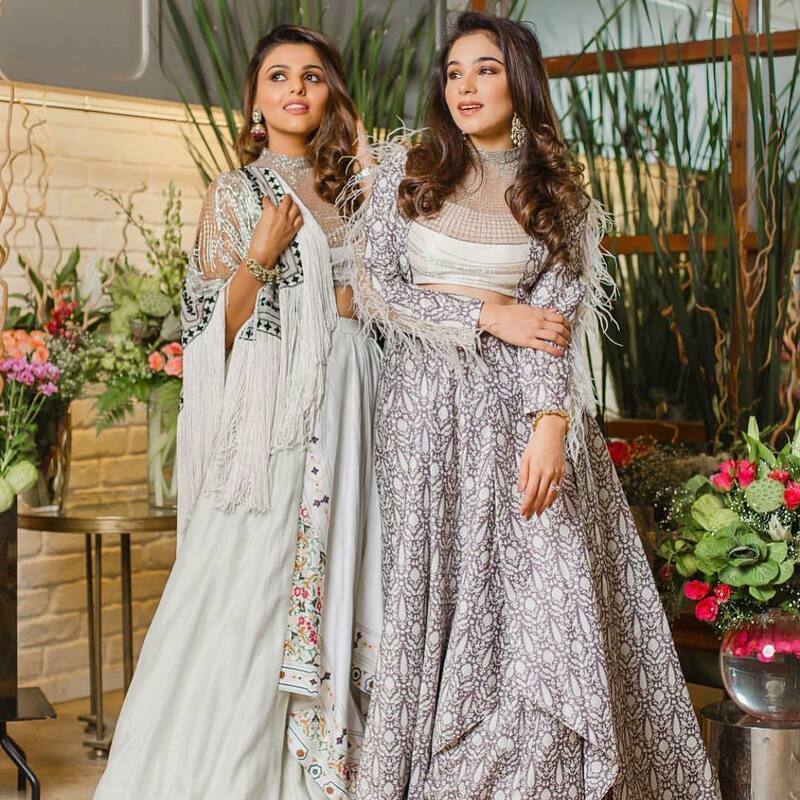 Their new bridal collection has lehengas with intricate floral work on them. Shades of pink and orange largely dominate their latest collection. You will also find some interesting bridal veils as well! The fashion world is rapidly evolving yet, Indian brides always tilt towards traditional designs when it comes to their wedding lehengas. Avdi is the proponent for that. They have re-created the old world charm in their bridal collection by giving due respect to the perspective of a modern bride. Every bride will fall in love with their designer bridal lehengas. Designer bridal lehengas don’t always have to come with a celebrity label attached to it. These new and budding labels are riding high on creativity and bring something new to the table every time. Devour the new side of the bridal couture with these new labels based in Delhi. Happy shopping! 8 Winter Lehenga Styling Tips To Rock Winter Weddings! 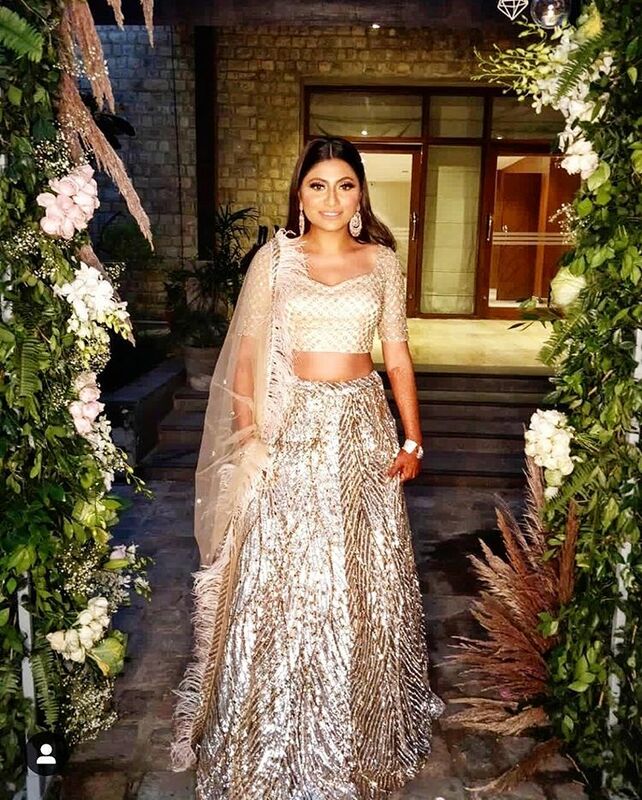 Here’s What All Isha Ambani Wore On Each Of Her Wedding Ceremonies!